Throughout the waterways of the island are fish you can catch. First, you'll need to get a fishing rod! As you go through the task of restoring the third tablet for the lighthouse, you'll rescue Cyril from the pains of hunger. In exchange for a tasty treat he'll give you a fishing rod. 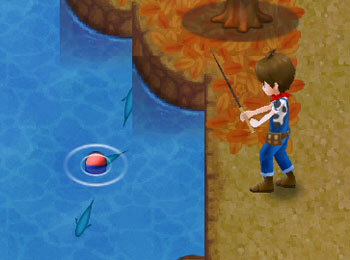 The next time you walk up to the edge of a water body, you'll see an action prompt to cast your line; the game will automatically equip the fishing rod when you select the fishing action. Once your line hits the water you'll see fish shadows swimming about. On occasion you won't see any fish. When that happens, cancel your fishing action and recast your line. Eventually a fish will nibble on your line. Simply wait until you see a ! flash above your head, then press the action button on your controller of choice to reel in the fish. Larger fish take more button mashing than smaller fish. You can also add bait to your fishing line. Using bait will encourage fish to bite faster, and some fish require certain baits to be attached before they'll bite your line. Sam sells Regular Bait for 10 G each. The other types of bait can be crafted using your farm Windmill, with the recipes unlocking as you complete Cyril's Country Life requests. You'll select the bait from your bag right before you cast your line. If you want to use a different bait, you have to completely back out of fishing (press the Cancel button until you can move again), then activate the fishing action again and pick a different bait. The types of fish you catch will vary on the time of day and the season you're in. There aren't any fish that require specific outdoor weather before they can be caught. Master Fishing Rod: 10 Softwood Lumber, 10 Iron, 5 Orichalcum, and 10,000 G.
The Master rod will randomly increase the number of fish you catch to two instead of just one fish, while the Glorious rod will upgrade that to three fish. The chance of catching more than one fish isn't very common though, as most of the time I'll only catch one fish. Fish can be shipped via your shipping bin, sold to Sam, given as gifts, or even used as ingredients for cooking or windmill recipes. Bastian will buy some fish from you for a higher price than Sam pays, but the chef doesn't buy all of the available fish types in the game. While you can fish at many water spots in the game, you won't find any fish if you cast your line when standing on the southern Beacon Island beach. For ocean fishing you first have to repair the pier by using 30 Material Stone, 5 Iron, 2 Mithril, and 5000 G. You can then cast your line when standing on the end of the dock. The pier just south of the lighthouse also needs repair before you can catch fish in that salt-water region, which costs 30 Hardwood Lumber, 10 Softwood Lumber, 5 Donkey Fur, and 5000 G.
There's a total of 34 fish species. The in-game encyclopedia will show you a summary of each one after you've caught it, including its preferred season and time of day. If you are playing the Special Edition of Light of Hope, the encyclopedia will also list the largest size and smallest size of each fish type you've discovered. The below information is what I've caught in the game. Some fish might appear in areas other than what I've confirmed. The only spot I could find Super Red Arowana is the pond on the east edge of the Beach: Eastern area, between the gap in the map-edge fence. That one pond also has Banjar Arowana and Green Arowana.